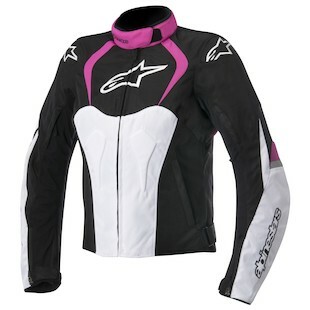 The Alpinestars Stella T-Jaws WP Jacket is a sporty option for your next fall / spring riding jacket. With the sportbike rider in mind, Alpinestars has given us another option to stay warm, be safe and look great at the same time. As a California native, this jacket appeals to me on that coast. I could see wearing this almost year-round in milder climates, such as San Francisco or Los Angeles. Since the outer shell doesn’t have any mesh and only minimal venting, it’s going to be too warm in the summer months. But it’ll be the perfect option in the morning when you leave for work and then riding home when the sun starts to set and it starts to get chilly. Pair this with a winter-weight base layer or heated liner, and you may be able to push this jacket to just above freezing temperatures. As a newly minted East Coast resident, I would definitely wear this one in the fall and early spring. If you run a bit on the warmer side, then you might be able to keep wearing this long after fall through the start of winter. The Drystar, waterproof membrane is breathable and fully integrated so you can’t take it out once it gets warm, but it will keep you dry when it starts to rain. The fit on this one is definitely for a sport or sport touring riders, with a fitted, European cut and a shorter length overall. The T-Jaws is available for $269.95 in two colors; black/white and black/pink, from sizes S-2XL.